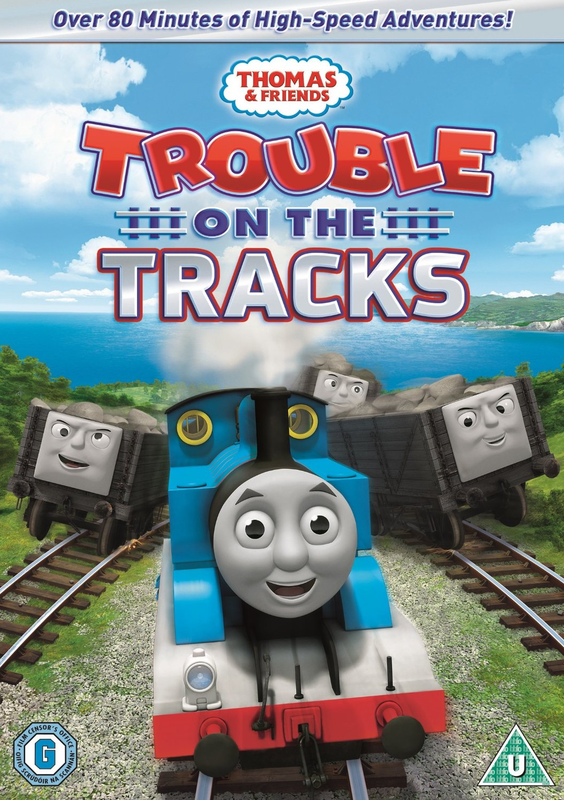 2015 is one of the busiest years for Thomas and Friends DVD releases, with one being released every month (apart from July, where there's two). 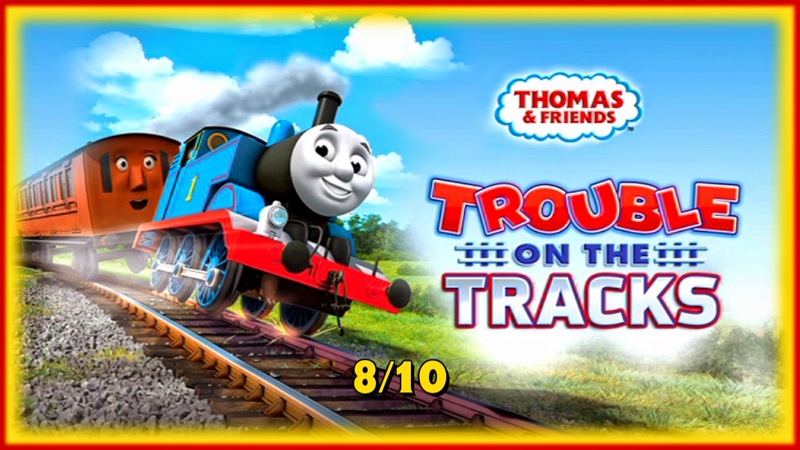 So to kick off, here are my thoughts on this year's second release, Trouble on the Tracks! I really like the selection, including the two extra episodes. They fit the theme of the DVD well and they're all pretty interesting. If you want to see my thoughts on each individual episode, click the links above. I have to admit, the features took me by surprise here. Not because of what was featured, but by how many there were. We kick off with Mr Perkins' Story Time, but rather than featuring one story, there are two, and neither of them feel out of place. The first was Pop Goes the Diesel, which was on the original American release. The second story featured was Toby's Tightrope. I quite like the edits made at the beginning of the story as it sums up the events that got Mavis to the point this story ended up at. That said, Marshall's illustrations felt a bit... out of place here. Gunvor and Peter Edwards' illustrations were some of the most realistic and artistic the Railway Series had. In comparison, Marshall's seem to stand out a lot more, which is a shame. Then we come to Mr Perkins' Postcards, which follows the similar formula to the previous segments. On this DVD, he sends a card about the Dieselworks. It's nice, and it includes a great description of what the Dieselworks is and does. The second postcard was about the quarries of Sodor. I like this one a bit more than the other one; it's nice. Although the postcard features Ffarquhar Quarry, all of the ones featured in the CG era (including the Clay Pits) are mentioned. It's great that Ffarquhar's was also mentioned to be the oldest again, especially since, in The Island of Sodor: Its People, History and Railways, it's said that the old coffee pots worked on the line to Ffarquhar, so it can be interpreted to be the oldest quarry based on that. The Earl's Quiz was the usual fare. It's OK for kids, but it's just not for me. The episodes featured were Percy's New Friends and Slippy Sodor. They aren't good episodes in the slightest, but like I said, kids may like it. The Calling All Engines features Salty and Paxton. They're really good. Like the last release though, the biggest surprise of this DVD is actually right at the start. There'd been a lot of talk of Sodor's Legend of the Lost Treasure before the trailer was released, but we ddn't think there'd be a trailer released for months. But I'm surprised, and delighted, that one was added here. I've already posted my thoughts (which you can see here), but for now I'll just say it's brilliant. Probably one of the best so far. Apart from a few errors here and there, and a couple of shots from one episodes that seem to be inspired from a previous special, the presentation here is excellent. The footage is well directed and animated, and it's sure to satisfy your kids. As usual, the RRP for this release is £12.99, but it can be brought for £5.99 at HMV or £6 at Asda. Some shops will also sell it for £7 or £8, so take your pick. While this release doesn't have the unique selling point that Dinos and Discoveries had, the overall content quality is far superior in my opinion. The episodes are, on the whole, much better and the bonus features are fantastic. That said, I would recommend shopping around for the cheapest price should you wish to buy it. I don't think it's worth anything more than £10 personally.